This project was conceived and designed by Steve Hines during the 5th year at the School of Design at North Carolina State University, tailored to attract the interest of Eastman Kodak where he was offered a position after graduation. 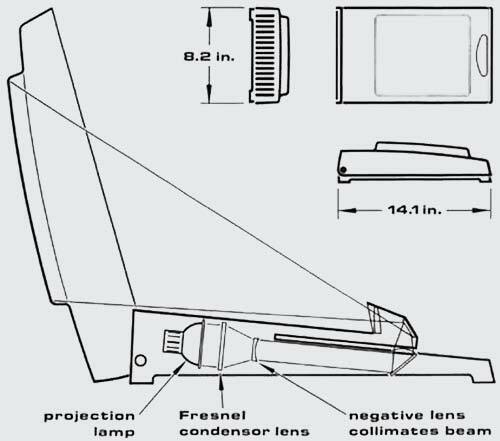 This is a folding microfiche reader with high-brightness screen in its lid. The microfiche is carried in glass flats on a slide and scissor linkage. The hinged lid protects the projection lens and film when closed. The lamp is positioned away from the microfiche to keep the film cool. The mock up and drawing of a folding desktop microfiche reader with handle in the lid. The reader opened to reveal the concave metallic projection screen, partially shielded from overhead lights, and at the angle to reflect the projected light to the viewer's eyes. The cover removed, revealing the scissor linkage to prevent rotation while allowing vertical and horizontal movement of the microfiche. The focusing knob deflected the cover to lift the lens which was located in the middle of the cover, hovering over the microfiche. The underside, revealing the ventilation slots across the back edge, and ventilation holes in the lamp housing. The power cord can be wrapped around the lamp housing for carrying. This product is not for sale. Do not contact us to purchase this product. This project is shown only as an example of past industrial design services. HinesLab currently offers consulting in the area of industrial design, novel solutions to your problems as well as a variety of licensable technology.